Successfully Added LED Halloween Decoration Lights - Solar Power, Pumpkin Design, 2 Light Strings, 7.5m String Lenght, 30 LEDs Per String to your Shopping Cart. These LED Halloween decoration lights offer you with the perfect way to spice up your property during the autumn months. The package comes with two LED light strings that each features 30 orange and scary looking pumpkin LEDs. These Halloween lights are sure to set the right mood and atmosphere for your party or haunted house. They can furthermore be used perfectly for the decoration of shopping malls, schools, and bars. Each light string features a length of 7.5 meters. This provides you with plenty of decoration possibilities. With these two LED light strings, your property will stand apart from all others during this year’s Halloween. The outdoor LED lights feature a waterproof design. Thanks to this, you’ll be able to use them even during those dark and rainy autumn days. 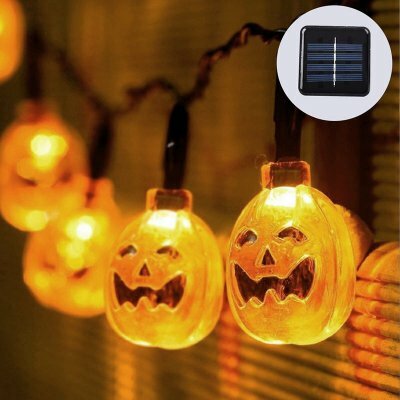 With its solar panel, these Halloween lights automatically recharge themselves throughout the day. This lets you use your LED decoration without the need of any extra batteries. When fully charged, this solar-powered LED light string brings along up to 10 hours of usage time. This is enough to create a spooky atmosphere throughout the darkest of nights. Your LED lights supports numerous different lighting modes. The light string itself can be easily attached to any surface. This means that you’ll be able to hang them from your window, door, porch, ceiling, or floor. No matter where you place them, these Halloween LED decorations are sure to put shivers down your visitor’s spines. With their colorful and scary design, these solar powered LEDs offer a great and affordable way to decorate your property for Halloween. These LED Halloween Decorations comes with a 12 months warranty, brought to you by the leader in electronic devices as well as wholesale LED Lights..